Take a look at the long list of summer events in the Stevens Point Area and you’ll soon see that there’s something for everyone. Festivals, fairs, races, car shows – you’ll find it all in the Stevens Point Area. Here are some summer event highlights. A number of regular events are perfect for visitors of all ages. Check out Stevens Point City Band Concerts at Pfiffner Pioneer Park on Wednesday nights through July. On Thursday nights, see the Central Wisconsin Water Walkers Waterski Show in nearby Mosinee. Don’t miss the Riverfront Rendezvous in Pfiffner Pioneer Park, July 4-6. The Amherst Family Fun Chicken Roast happens on July 4. And, the Fourth of July parade takes place, appropriately, on July 4 in downtown Stevens Point. The Iola Annual Car Show, July 11-14, brings thousands of visitors from around the Midwest. On July 16, lace up for the 11th Annual Take a Step 5K Walk/Run. July 18-19 is Krazy Days in downtown Stevens Point, with a day of food, music, great deals and more. The Portage County Fair happens July 18-21. The Rosholt Thresheree brings antique farm machinery to Portage County, July 19-21. On August 3, enjoy Corn on the Curb in downtown Stevens Point. Don’t miss the Point Tap Festival, August 8-10. 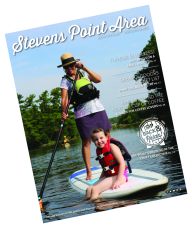 Find a complete list of Stevens Point summer events.